We’re pleased to announce a major update to the Linode Manager mobile app! This release is a complete rewrite of the app, featuring a beautiful new design and support for both iOS and Android devices, including the iPhone, iPad, iPod Touch, Android phones, and Android tablets. Linode Mobile features tools to manage your Linodes, NodeBalancers, and domain zones. 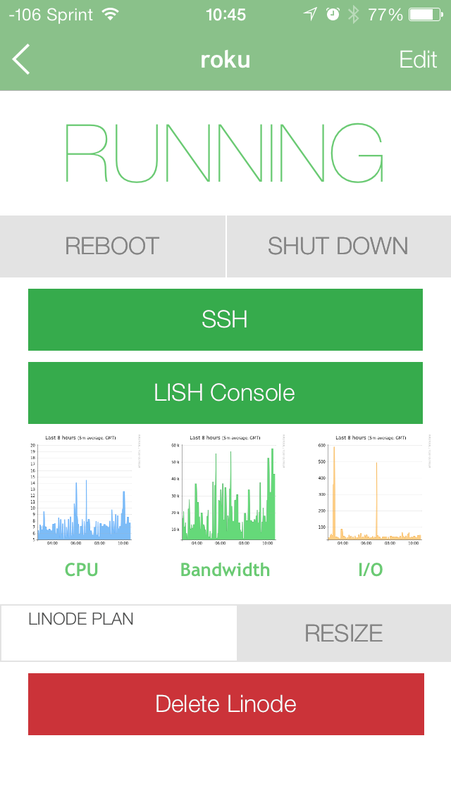 You can access Linodes via SSH and Lish, browse the Linode Library, and manage your Linode account. More information can be found on the Mobile App product page. Existing users of the iPhone app can update to the newest version directly from the App Store. Otherwise, you can install the app for free from the App Store or Google Play. We’d like to give a big THANK YOU to WillowTree Apps for helping us make Linode Mobile 2.0 a reality. Not compatible with any of my phones on the Play store… what gives? Are there plans to support 2FA login? I was not asked for my code. Edgeman, welcome to the Android ecosystem. It app seems to just work on my iPhone. I have what seems like compatible devices (Nexus 4 and 5), but get “This item cannot be installed in your device’s country”. Looking good with a modern design. The only thing I’d recommend is to make the .apk available for people to sideload. Ryan: They’ve just locked it to a specific country, hence it’s not “compatible” with my devices located in Canada. Nothing to do with the so called “Android ecosystem”. iOS Apps can be region locked as well. The Android app wasn’t set up for all countries at first. This has been corrected, but it may be cached on Google’s side for a bit. Sorry for the trouble. Enjoy! This post says version 2.0, but the Google Playstore on both Nexus 4 and 7 says version 1.0? Are the rest of you seeing a 2.0 version? John: 1.0 is the correct version on Google Play (this is our first Android release). Sorry for any confusion! Looks great! My only “complaint” so far is that it bypasses two-factor authentication and IP whitelisting. Any chance we can get support for multiple account logins? Very good,I wait for the android app long time. This is nice, thanks! It’s a nice touch that the linode library is available in the side panel. The delete button is a little too prominent. It’s directly below tappable status graphs, and resize for example. I guess this doesn’t work with Two-Factor Authentication or Whitelisting, as I can’t log in. What about Windows 8 and Windows phone support? So If my phone gets stolen they can delete the linodes that I have? Why do Accounts that have Stats only access do not see any linodes? +1 for making the delete button less prominent/scary. Looking forward to 2 Factor support, and ideally a passcode on the app instead of going right into the signed in account. – Doesn’t need an API key or 2 factor auth? Yikes. Like that possibility to control my linodes from android. Actually that is great to access all: linodes, jenkins, jira from mobile, and to work even if you are in transport etc. GREAT JOB!!!! As if I needed a reason to be happier with Linode! Thanks! Just tried out the new linode app on the iPhone. First thought was, “where do I enter the api code?” No api code required??? The second was “omg look at that delete button!” As a point of reference, iPhone app deletes are usually only shown in “edit” mode or with a swipe. Check out the contacts app on the iPhone to see what I mean. You delete a contact by first entering edit mode for that contact. In the Linode app case, delete is always there and there is an edit mode which only edits the name. This should be where the delete button is located. Please… version 2.1? Do you plan to release mobile app for Windows Phone? Thank you. +1 for Windows (Phone) 8!! Very nice, but I think it’s better to move “Delete Linode” Button to elsewhere, since it’s not really a common action, and it’s dangerous. A expandable panel may be a better solution, which hides the remove button. It’s amazing !!! but I too like to move “Delete linode” button to somewhere else. I like it but I can’t use it because there’s not a passcode much less 2 Factor. My password is really complex so I have to look it up each time. Other than that, this is a great app. Also, I like the idea (stated above) of app permissions. I’d be more comfortable going to the desktop browser to delete if needed or at least verify password on delete (it might but I didn’t try). – enable rsa_pub key (ConnectBot allows RSA keys for instance) + force password for lish (possible to leave session open and get straight in without having to log into the server). – remove the “remember me” and force login every time app is opened – security shouldn’t be about convenience. – Introduce session timeout for app (don’t want it running in the background 24/7). App is nice and handy to have on my iPad… however it required me creating a less secure account to use it as the app doesn’t handle MFA enabled accounts. Would have been nicer if it used the API key to authenticate or offered you the ability to enter the MFA code. 2FA is coming to the mobile app: https://blog.linode.com/2014/02/03/linode-api-multiple-keys-and-two-factor/ – stay tuned! It’s sooooooooooooooo good, I was waiting the Android app for so long time! Any plans to release a windows phone app? Are there apk download links for those that don’t want to use the play store?